MONTEBELLO – As part of the Montebello Unified School District’s effort to educate and promote the benefits of a healthy lifestyle within the school community, MUSD garden club students gathered at the second Farmers Market on Saturday, June 14 to sell organic produce to their families, neighbors, friends, fellow students and those who are interested in purchasing affordable, local and organic fruits, vegetables and herbs. 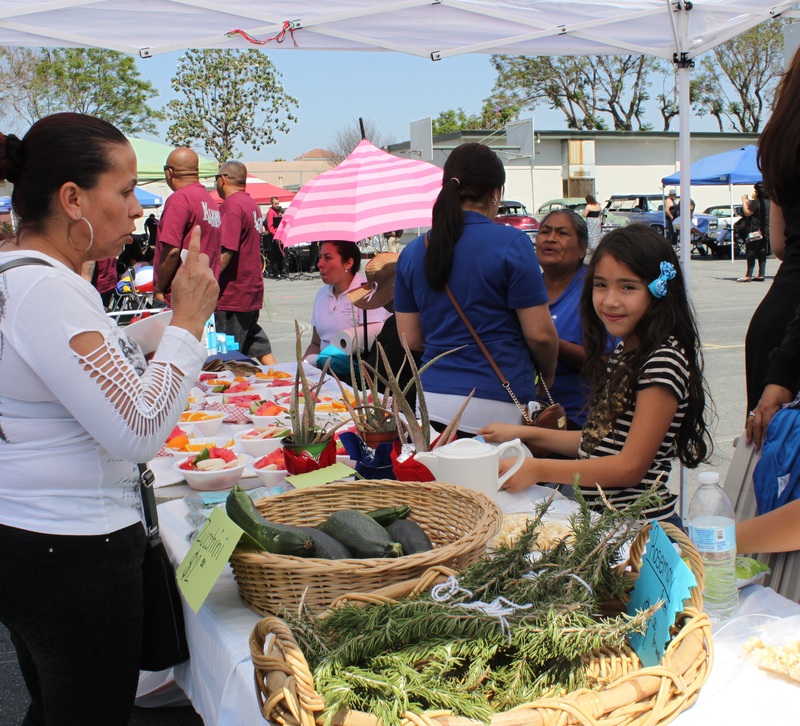 More than 500 students from across MUSD, who are active garden club members at 10 schools, worked with their advisers this season to sell their harvests at the event held at Bell Gardens Intermediate School. The Farmers Market also featured a car show held in collaboration with the Originals Car Club of East Los Angeles, which showcased beautiful vintage cars from the 1930s to the 1970s. “We are strong proponents of the fact that education and nutrition go hand-in-hand,” MUSD Board of Education member Lani Cupchoy said, who was part of the MUSD team that spearheaded the first school garden at Bell Gardens 20 years ago. “This event, like our school gardens, continues to grow and thrive, and it illustrates our commitment to not only combat high rates of illness and disease, but to bring the community together in the name of health. Students in the club are equipped with knowledge regarding nutritional food choices, water conservation, at-home gardening tips and are taught about ingredients and how to read food labels. Additionally, students are able to take home whatever they plant and harvest during the school year. Students sold tomatoes, celery, sugar peas, onions and a variety leafy greens, fruits and herbs, as well as organic cleaning supplies. Other student organizations from across the District brought items and wares to sell as well. Profits from sales at the Farmers Market went directly back into the individual clubs. Participating schools included Garfield, Wilcox, Bell Gardens, Cesar Chavez, Suva, Winter Gardens elementary schools, and Bell Gardens, Suva, Macy intermediate schools and Bell Gardens High School. The District is also collaborating with program directors and advisers, as well as Nutrition Services, to possibly incorporate garden club items in school cafeterias. The event also featured free health and wellness services by Family Health Care Centers of Greater Los Angeles, compost recycling demonstrations were conducted by Athens Services and planting demonstrations were provided by Home Depot. Entertainment was provided by the BGI Generation Dance Team. Farmers Market1: Student smiles as she works to sell produce to a customer. Farmers Market2: Girls from Cesar Chavez Elementary school pose as they sell their greens, squash, tomatoes and other treats. Student smiles as she works to sell produce to a customer. 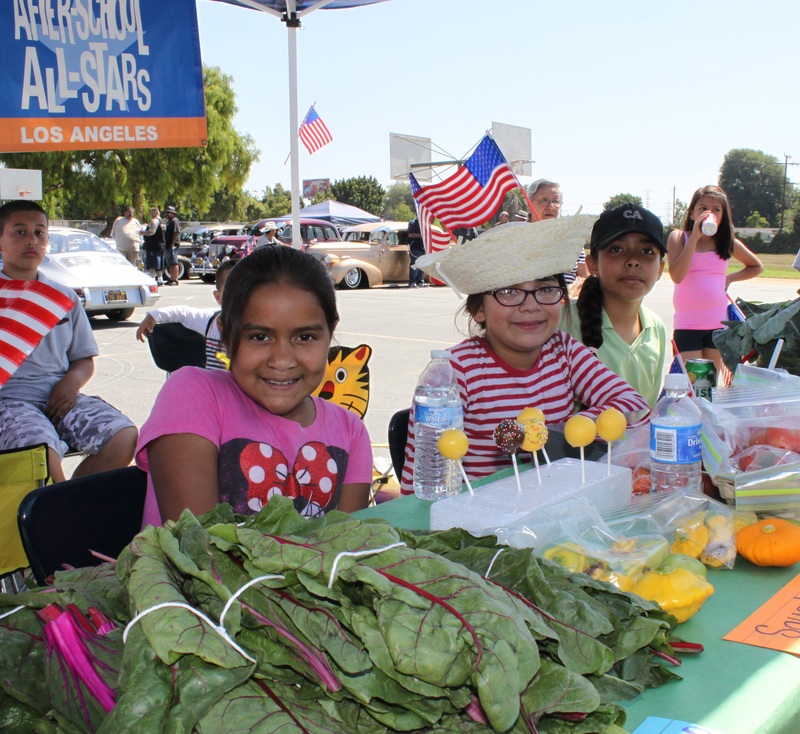 Girls from Cesar Chavez Elementary school pose as they sell their greens, squash, tomatoes and other treats.